Our neighbor Linda needed a way to boost her house's small solar electric system during cloudy periods. She wondered if a bicycle could be adapted to make enough electrical power for her water pump, which is her minimum electrical need. I was planning to build a wind turbine, including it's low-speed alternator. The turbine alternator I had in mind functions at less than 400 rpm and so does a bicycle wheel. That got me thinking . . .
Hugh Piggott's turbine site: Scoraig Wind Lots of people have experimented with power bikes. You can see examples here and here. and here. Here is an off-the-shelf commercial version. 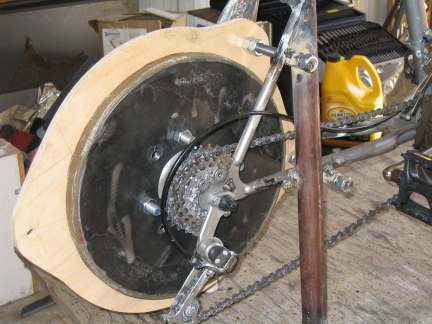 With normal mountain bike gearing and the alternator's power curve rpm being a good match, I figured that if I could find a way to mount a Hugh Piggot-inspired axial flux alternator on a bike axle, it might make a decent power bike. The advantage of this approach compared to others I'd seen is the efficiency of the power delivery. Having done a lot of mountain biking, I am quite aware of how little power normal humans can deliver continuously. Large friction losses would render a power bike an impractical curiosity, not a serious booster for a solar system. 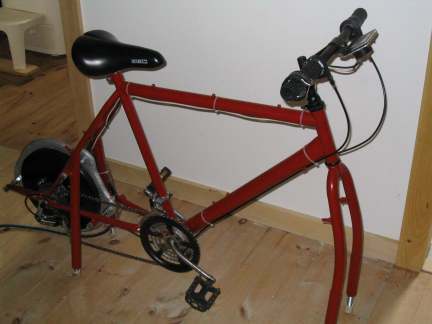 I had no interest in building a bike that wouldn't be used because of inefficiency. So I set out, with a lot of help from my friends, to build a power bike for Linda and at the same time gain experience in alternator construction in preparation for building wind turbines. 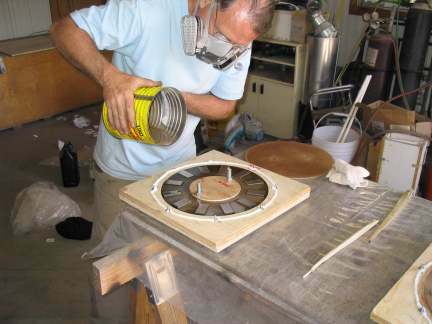 Here is my friend Frank pouring polyester resin into one of the rotor moulds. 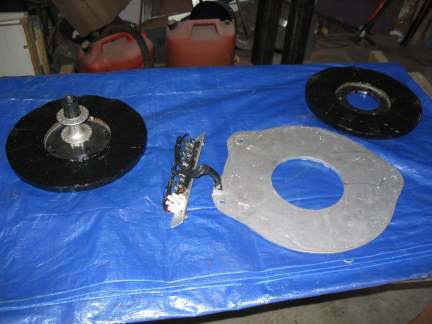 Each rotor consists of a 5/16" thick, 12" diameter steel plate with 12 permanent magnets glued around its perimeter. 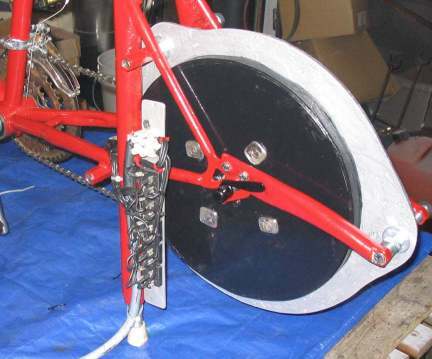 Mostly because of rotors' heft, the completed bike weighs 72 pounds. Here are the freshly painted rotors (black) and the stator, which is a polyester resin casting containing 10 coils of magnet wire to form the alternator windings. Linda wound the coils. 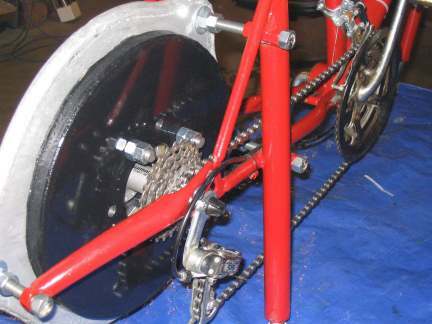 The left rotor is bolted to the disk brake mount on the bicycle hub. That new hub cost about the same as the used bike. Here is the plywood stator template installed between the two rotors. At this point I am building the mount from the axle dropouts on the frame to the hole at the rear of the stator. I sorted through a lot of old bikes at a Pembroke pawn shop before I found this one. It was a cheap CCM mountain bike for which I paid a steep $65. But it had nice thick steel frame tubes so I could weld it easily without blowing holes in it. Here is the completed drive side. Once the bike was fully assembled it didn't run as smoothly as I'd like, so we put on a new chain and repacked the bottom bracket bearings. That made it quiet and smooth. With so many gears to choose from, you can dial in both your desired peddling cadence and resistance level exactly. 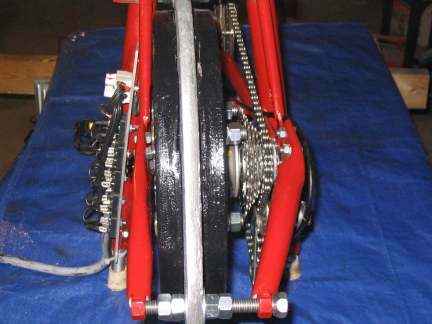 The clearances between the frame and left rotor are very tight, as is the required clearance between the rotors and stator; about 1/16" all around. The slight triangulation of the rear stator mounts gives them just enough rigidity to firmly locate the stator. The mounts are made from the tapered oval front fork tubes from an old bike I found at the local dump. I had to do a lot of heating and bending of the left chain stay and seat stay of the frame to get clearance for the left rotor. The whole thing looks too tight to turn freely, but it does, silently. Here is the bank of five rectifiers that convert the alternating current to direct current for battery charging. There wasn't room for nuts on the threaded rods joining the two rotors so I drilled and threaded and then welded squares of 1/8" steel to the ends of the mounting studs. They just barely clear the frame as the rotors turn. This is Frank, Tamara (Linda's daughter) and me carrying the bike into the house. The thing is heavy. Here is Linda testing out the bike. This is a very satisfying bike to pedal. It is quiet and smooth and produces good power, about 30 amps peak and 5 to 10 amps continuous, depending on your bike fitness level. 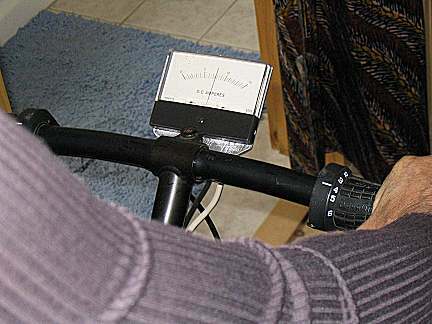 Peddling resistance builds in a perfectly linear way as the alternator rpm rises. A look over Linda's shoulder as she pedals. She's making about 8 amps, full scale being 15. Our local electronics guy Brian, who helped with wiring and other issues, happened to have this good-looking ammeter still in its original box. He figures he's had it for at least 30 years. It's a nice touch. This was a fun project all round. I guess time will tell if the work and cost was worthwhile. Having built this alternator, I have a lot more confidence in building one for a turbine that will be a hundred feet in the air.